I space out in class. There! I said it. It's actually quite a problem, because when I get spacey, I start thinking about things that I happen to have lying about the refrigerator and the kitchen, like leftover white chocolate creme anglaise or beautiful chunks of crystallized ginger or egg yolks. 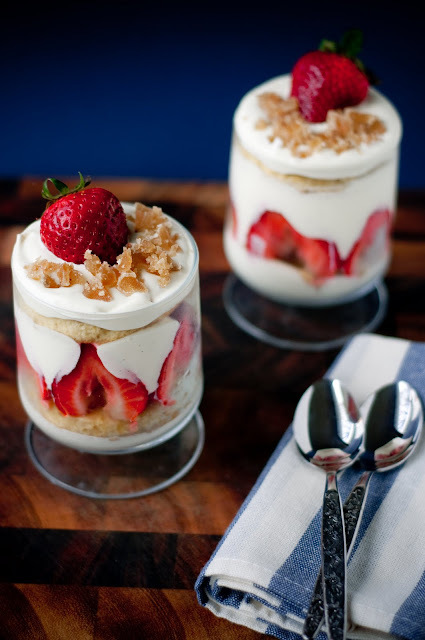 Ginger, white chocolate, and strawberry trifles. Oh boy! 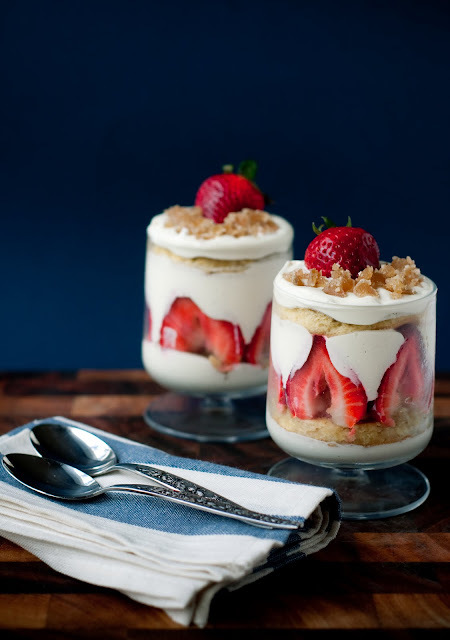 I sure to wish all of my daydreams turned out so well, with layers of ginger genoise cake, white chocolate creme anglaise whipped cream, and fresh strawberries. The genoise cake recipe that I used here is an all egg-yolk genoise, from Rose Levy Beranbaum's The Cake Bible. It's one of my favorite genoise recipes because, with all of the egg yolks, it's much more moist than your average whole egg variety--and, it's a great, yummy way to use up leftover egg yolks. To adapt Beranbaum's recipe to a ginger genoise, I added ground ginger to the batter and also huge, rough chunks of crystallized ginger. When it came out, the cake was magnificently studded with all of this sweet and spicy crystallized ginger and then I brushed it with some homemade ginger syrup that I had sitting in the fridge (that stuff also makes great homemade ginger ale). To use up my white chocolate creme anglaise, I folded it into whipped cream. It was actually quite a discovery when I found out that the white chocolate creme anglaise sets up nicely in the fridge, to almost the consistency of a light pudding! With the creme anglaise folded in, the resulting cream is thick and luscious, packing just the right amount of sweetness and an incredible vanilla taste. 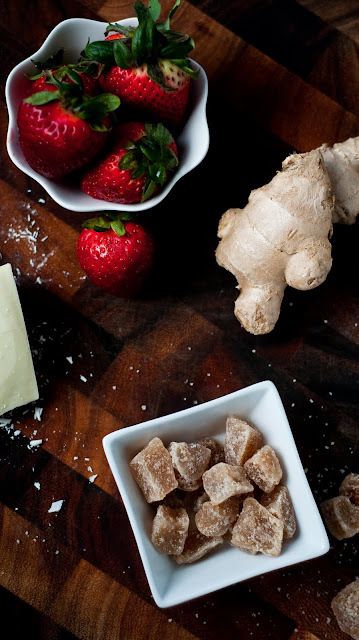 for homemade crystallized ginger and ginger syrup, see David Lebovitz's recipe here, except make bigger chunks rather than small slices. You will need ~1 cup of this recipe, so save the rest for another use. 1. Place chopped white chocolate in a bowl with a fine sieve on top. Set aside. 2. In a separate bowl, whisk together egg yolks until light. Set aside. 3. In a saucepan over medium-high heat, combine milk, cream, sugar, and salt. Scrape the seeds of the vanilla bean into the milk mixture and put the pod in as well. Bring to a near simmer. 4. Whisking constantly, pour a small but steady stream of the heated milk and cream into the egg yolks to temper. Do this slowly, while whisking quickly. Once the milk and egg yolks are combined, return to the saucepan and to the stove. 5. Heat the egg yolks and milk mixture while stirring constantly, making sure to scrape the bottom so that nothing burns or sticks. Slowly bring the mixture to a boil and cook until it thickens enough to coat the back of a spoon, about one minute. Remove from heat immediately. 6. Pour the hot creme anglaise through the strainer onto the white chocolate. Let sit for a minute and then whisk until the white chocolate completely melts. 7. Let cool completely in the refrigerator. 1. Preheat oven to 350 degrees F. Prepare a quarter sheet pan, lined with parchment paper and then lightly greased and floured. 2. Combine flour, cornstarch, and ground ginger and set aside. 3. On the stove, heat the butter until the solids drop to the bottom and begin to brown. Remove from heat immediately and strain through a fine mesh strainer to remove the solids. Add the vanilla extract to the liquid butter and keep warm. 4. In a mixer bowl over simmering water, combine the egg yolks and the sugar. Whisk constantly until the mixture is almost hot to the touch. 5. Transfer the warmed egg yolks and sugar to the mixer and whisk on high for five minutes. 6. Add the water to the eggs and sugar, and whisk briefly on medium to combine. 7. Using a large balloon whisk, fold in the flour mixture to the eggs in two parts. 8. Fold in the melted butter and vanilla to the batter in two parts. Do not overmix! 9. Fold in the chopped crystallized ginger, being careful not to overmix. 10. Immediately pour the batter onto the prepared pan. Smooth out the batter, though it may not fill the whole pan--that's okay. 11. Bake for 20-30 minutes until the cake is golden and the top springs back when lightly pressed. Remove from oven and cool. 1. Whisk the white chocolate creme anglaise for a few seconds. Set aside. 2. Using a large balloon whisk, whip the cream until soft peaks, gradually adding the powdered sugar. 3. Gently but quickly, fold in the creme anglaise to the whipped cream. Use immediately. 1. 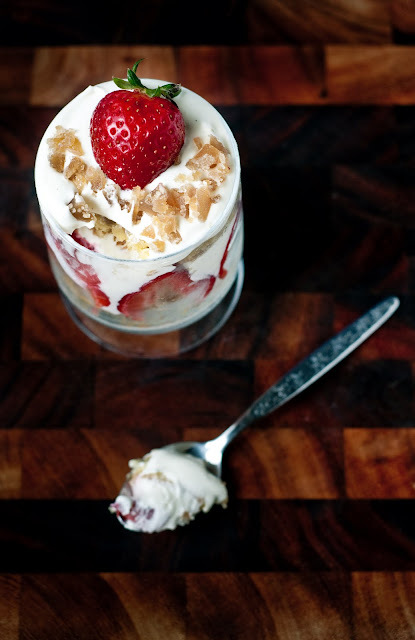 Using a large round cookie cutter about the size of your trifle glass, cut out cake rounds from the genoise. 2. Brush the cake cut-outs liberally on both sides and all edges with ginger syrup. 3. 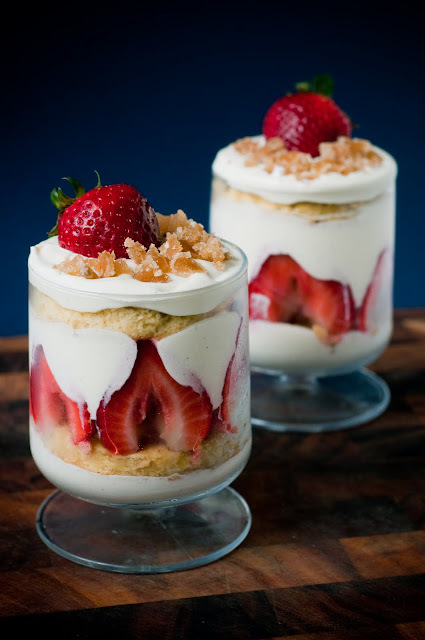 In each trifle glass, layer cream, cake, and strawberries. 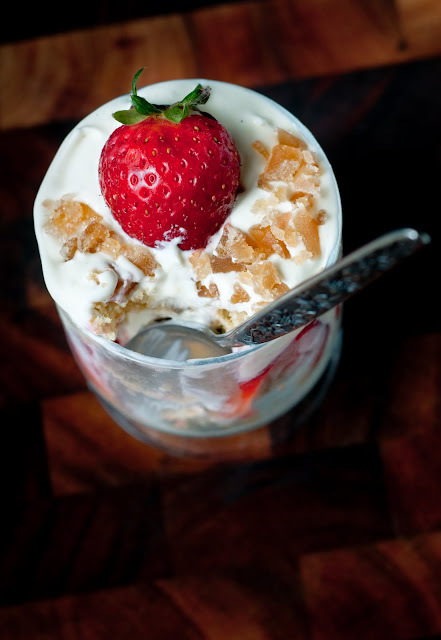 Top with extra chopped crystallized ginger and strawberries. Tip: a large star piping tip is a great tool for hulling strawberries. At least you didn't title the post the trouble with trifles. Beautiful! I love the perky little strawberries. It is a beauty. Great flavors. 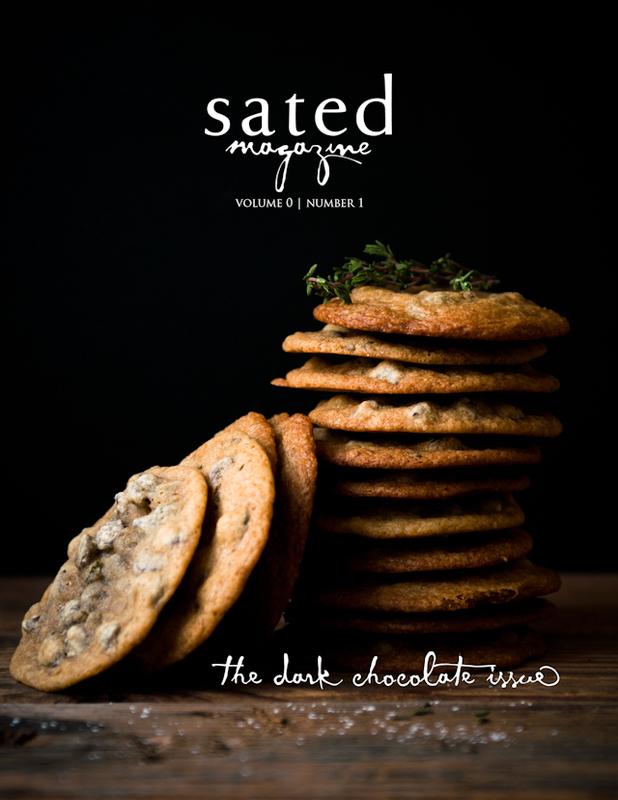 @anna, @comfycook: thanks so much! Oh wow that looks fantastic and your photography is amazing, now I won't be able to pay attention in class either because I'll be thinking about this all day ;) Great post! This is absolutely sinful looking. 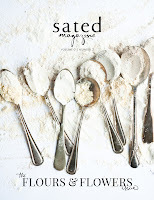 I daydream about what to cook and blog about too, but I wish I were half as good at actually using up my leftover ingredients before they go bad. Loving the darker photography, too.